Aquamarine crystal | Flickr - Photo Sharing! 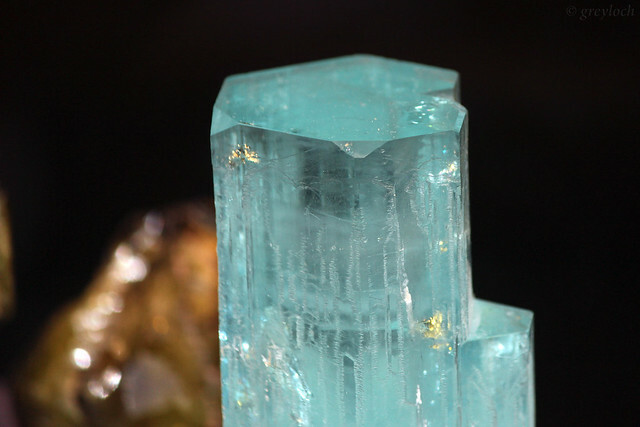 A raw, uncut tower of beryl gemstone material - Aquamarine in this instance. Update 1: This image was used by Jewelry Information Place as the banner for March's birthstone. This is so cool! UPDATE 2: My Aquamarine crystal photo was found on an Italian site about Aquamarine's Crystal Therapy Benefits Properties. Kind of bizarre but sure, why not? UPDATE 3: My photo of this uncut Aquamarine crystal was chosen by the International Gem Society in their article "A Beginner’s Guide To Common Gemstone Heat Treatments". This is a premium article on the IGS web site and I cannot read the full article but it was very nice to see my photo being used with credit given. This is one of my photographic career goals; to add to the world-wide knowledge of various areas (armor, gemstones, metallurgy, costumes, history, et al). ab201434, and 12 other people added this photo to their favorites. This is such a great picture! Thank you so much for sharing it!